Under the lofty ceiling of a magnificent room, a handful of Toronto graphic designers convened at the landmark Arts and Letters Club. It was 1956. The group's primary goal was to create awareness of the unique skills of designers; it also helped to launch the profession in Canada. To transform a small society based in Toronto into a national presence within the growing communications industry was no small task. 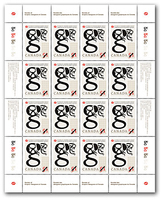 Five decades later, a domestic rate (51¢) stamp will be issued to commemorate the founding of The Society of Graphic Designers of Canada. 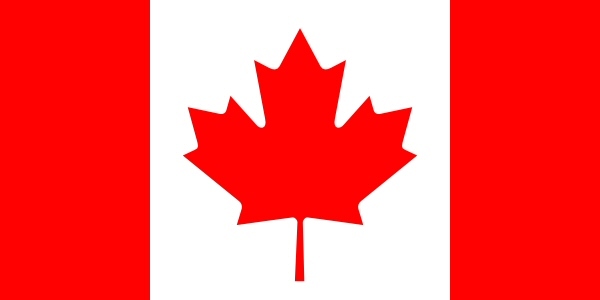 A red maple leaf between two red bars anchored on a white backdrop -- our Canadian flag -- is an iconic example of graphic design. This magazine you're holding at the moment is another. Graphic design is a ubiquitous communications tool that uses visual elements and text to convey an idea or concept. The design behind the Society's 50th anniversary stamp, created by Vancouver's Ion Design Inc., is a simple, symbolic approach. 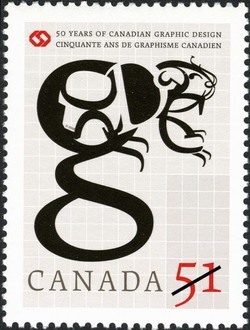 The rather minimalist work features a stylized lower case "g" that also forms a unique interpretation of a beaver, a treasured Canadian symbol and the subject of Canada's very first postage stamp. "Our intent was to create an icon that represents the Canadian graphic design community using type and image. The beaver seemed a natural," says Ion Design partner David Coates. "Sir Sanford Fleming recognized that when he designed Canada's first stamp. And we drew upon his original design for this stamp." "Our approach," adds Rod Roodenburg, also a partner of Ion Design, "is a sober and clean, more restrained design. One of our self-imposed directions was to combine typography and image in a clever way that epitomizes what graphic designers strive for when creating a successful icon or image. The abstract typographic construction of the beaver captures this essence, and conveys to some degree the psyche of the Canadian designer." The origin and art of graphic design can be said to have evolved out of the ancient East's printing craft. The oldest printed book bearing a date -- the "Diamond Sutra" -- was made in 868 AD using carved wood engravings. Over the centuries, the traditions and techniques in the trades of printing and typesetting, illustration and design spawned legions of layout and lettering artists, calligraphers, illustrators, type compositors, plate makers and printers with the skills needed for print reproduction. Small independent design studios with between five and 25 employees continue to be the backbone of the industry in Canada today. Consequently, the Society's mandate and membership is broader than ever before. Practical professional graphic designers, design educators, design administrators, design students, associates in related fields and corporate sponsors form a network of professional assistance that acts as a resource to the profession and the public. According to Coates, designing a visual that would be exactingly scrutinized by members of the design profession was a real challenge. But they also realized that the stamp would need to appeal to more than just designers. "When you first look at it," says Coates, "you see simple lines. You see type treatment. But when you look closer and you see the other levels, you recognize the iconic aspects. That's what design is about." For more information, visit: www.gdc.net. Designed by David Coates. Designed by Roderick C.J. Roodenburg. Designed by Len-Nard Yambot. Canada Post Corporation. Canada's Stamp Details, Vol. 15, No. 3, 2006, p. 16-17.